The next step in the 3D printing revolution may be body parts including cartilage, bone and even skin. Three-dimensional printing is a technique for making solid objects with devices not unlike a computer printer, building up line by line, and then vertically layer by layer. While the approach works with polymers and plastics, the raw ingredients of 3D printing have been recently branching out significantly. The printers have been co-opted even to make foods, and do-it-yourself biology experiments dubbed "garage biotech" - and has most recently been employed to repair a casting of Rodin's sculpture The Thinker that was damaged in a botched robbery. But at the annual meeting of the American Association for the Advancement of Science in Washington DC, the buzzword is bioprinting: using the same technique to artfully knock out new body parts. James Yoo, of the Institute of Regenerative Medicine at Wake Forest University, told the meeting of his group's aim to print skin directly onto burn victims. "What motivated us to start this programme and development is the wars in Afghanistan and Iraq," he said. "Up to 30% of all injuries and casualties that occur from the war involve the skin, and using bioprinting we thought that we could address some of the challenges they're facing with burn care." Professor Yoo's group is developing a portable system that can be brought directly to burn victims. "What's unique about this device is that it has a scanner system that can identify the extent and depth of the wound, because every wound is different," he said. He added: "That scan gets converted into 3D digital images; that determines how many layers of cells then need to be deposited to restore the normal configuration of the injured tissue." Hod Lipson, director of the Computational Synthesis Laboratory at Cornell University, brought a 3D printer to the conference, to demonstrate how his well-established project, named Fab@Home, is branching out into bioprinting - by creating an ear. 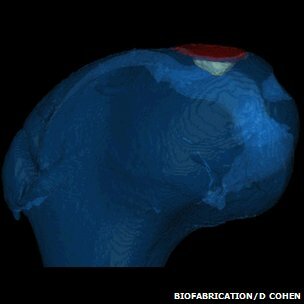 The machine starts with a computer file with the 3D coordinates from a scan of a real ear. For the demonstration, the real cells that the group would normally use have been replaced with silicone gel in order to bioprint the shape. The team has also published its results from bioprinting repairs in damaged animal bone. But the method is still in its infancy, and several technical hurdles lie between the groups' current efforts and a future in which injured body parts are repaired digitally on-site or simply printed out fresh. "Some tissues can be handled more easily than others," Professor Lipson said. "We and our colleagues have started with cartilage; it's amorphous, it doesn't have a lot of internal structure and vascularisation - that's the entry level point to start with. "That has been fairly successful in animal models, and that would be the first thing you'll see used in practice. From there we'll climb the complexity of tissue, going to bone, or perhaps liver." Another concern is that bioprinted tissues aren't easy to connect to the real thing. "One of the advantages of using the computerised printing is that you can create a tissue construct in a more accurate manner than when you're trying to build something manually," Professor Yoo said. "But how can we create and connect those tissues produced outside the body? Whatever you put in the body has to be connected with the body's blood vessels, blood supply and oxygen. That's one of the challenges we'll face with larger tissues." Whatever the challenges ahead, Professor Lipson told BBC News that he believed bioprinting will overcome them to become a standard technique. "If I have to guess, I'd say that in 20 years this technology will be mainstream, absolutely," he said.